The EC Banner is an exceptional tension Fabric Display that Tenji has developed to be the perfect alternate option for those who want the next level of quality compared to that of a typical Roll up banner, or want a more affordable alternative to Tenji’s Tension fabric Walls. 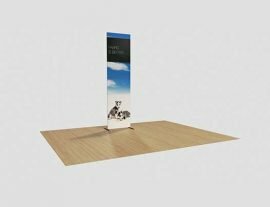 These innovative new systems are guaranteed to give your advertising spaces that beautiful appeal that you just cannot achieve with traditional displays, ensuring that you stand out in the masses. This exceptional new display consists of two ultra thin, high durability aluminium poles, three crossbars and two feet. The design of the frame ensures that the EC Banner remains extremely sturdy and maintains a tight, smooth finish on the fabric. The EC Banner’s versatility can be attributed to how light and manoeuvrable it is. It is so light that you can move it around on your own with no effort, and can reorganise the style on a whim. The print of the EC Banner is made of the same Stretch Fabric Technology that is found on all of Tenji’s other FLEXAD Displays, Because of this, it gives that extra quality that makes these displays superior to the Roll up banners. On it’s own, the EC Banner makes for the perfect display. 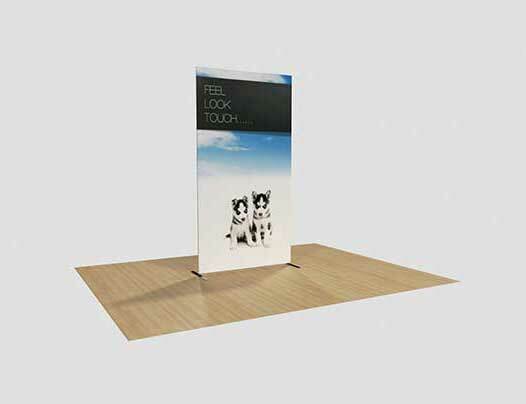 However, when you combine multiple or if they are combined with any of Tenji’s other Displays, they will add an unparalleled charm to any and all of your advertising spaces that you simply will not be able to find with any other system, whilst remaining far more inexpensive for higher quality. The EC Banner can come in any of three sizes, 610mm, 850mm or 1220mm wide, and they all sit at a height of 2280mm. These three variations can be used on their own for an amazing individual display, or you can combine and swap these sizes to add a degree of personalisation that you cannot achieve otherwise. These incredible new displays are the culmination of both the Banner stand and the tension Fabric wall, making it the perfect middle ground for both Options. 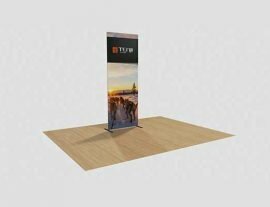 Give your Brand that extra advertising boost that no other display is capable of with Tenji’s EC Banner.